Ask fellow campers about "St. Peters' 370 Lakeside Park" and nearby attractions. We stayed 3 nights at the CG. Our main objective was to visit the Arch in St. Louis as we are trying to visit as many national parks as we can. This is a very picturesque park and kept very nice. The staff was very friendly and provided us with information on where different eating, shopping, etc. places were and their address. Walmart is close by. Our site was close to the lake which gave us nice views. Wifi was good the first day, but couldn't get on after that. We enjoyed walking around part of the lake. We would stay here again if in the area. 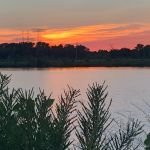 We camped at St. Peters' 370 Lakeside Park in a Travel Trailer. 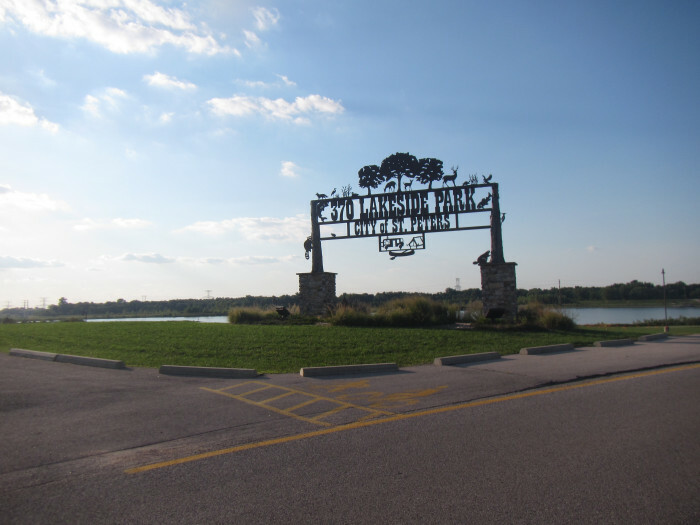 The park is close right off of M-370, which is about a mile from I-70. The people are friendly and the park is kept clean. It is a city park, so there may be other activities going on. When we arrived, there was some kind of walk-a-thon going on, so there was more traffic then usual in the park. The interior roads are paved, and our site was gravel and asphalt. AT&T cell service and hot spots worked well. We tried to use the park's wifi, but it wasn't working most of the time, or we couldn't get connected. OTA and satellite TV worked well. We come thru the St. Louis area a couple of times a year, and this is the only park we will stay out. We camped at St. Peters' 370 Lakeside Park in a Motorhome. This campground is in a very nice county park by a small lake. The campground is made up of three loops. Some pull through sites in the middle, and back ins around the perimeter. Very well maintained. Nice clean restrooms and a laundry onsite. Not much shade, trees are on the smaller size. Easy to navigate with a big rig. There is a very nice dog park in this county park that you can get a temporary membership to if you send in your application ahead of time. It even has a gate you can take your dog through where they can go into the lake. 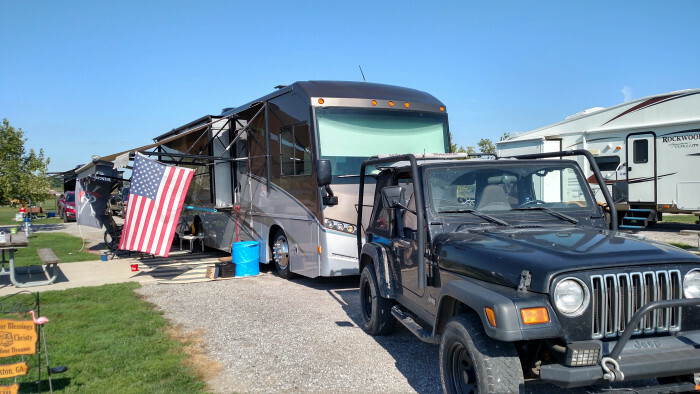 We camped at St. Peters' 370 Lakeside Park in a Fifth Wheel. There is a very nice dog park in this county park that you can get a temporary membership to if you send in your application ahead of time. It even has a gate you can take your dog through where they can go into the lake. First appearance here was very nice, but after setting up it is more like average. As you come in you see some concrete pads, but there are not many of them. Most of the sites are small stone and with what looked like ground up asphalt. Our site, 416, looked like it was ground under repair. Utilities were good, WiFi not so good. I can't see paying the extra $5 per night for what they call a premium site. On the pull thru sites an extra $5 works for a night or two but not on longer stays. But given the location, there really are not many other options and we would return. OTA TV was excellent. We camped at St. Peters' 370 Lakeside Park in a Motorhome. Mattingly's Sports Bar has daily HH from 3 - 6 with $2.25 domestic long necks and $2 well drinks plus food specials. We ate there twice and both times the food was good. Third Wheel Brewing has half price brews during HH on Fridays from 3 - 6. They have a good beer selection. There is a food window under different mgmt with very good burgers and other food selections available. Arrived late, staff pleasant. Nice level site easy to get into. Convenient hookups. We stay here fairly often. Must make reservations if arriving on weekends. We camped at St. Peters' 370 Lakeside Park in a Motorhome. Visit Main St in St Charles. Plenty of good restaurants. You can work out and swim at the St Peters rec-plex. Very nice new park. Easy angled back-ins and lots of room. Three small circles of sites makes for less traffic. Walking/biking trail right at your door. Very well managed and taken care of. Beautiful pavilions. It is 35 miles to downtown St Louis, but still this is the best place to stay. We camped at St. Peters' 370 Lakeside Park in a Motorhome. Nice park run by the city but not more then a 7. All sites are in the open. Spacing is very good. WiFi was barely adequate. Stayed here because there aren't many good CGs in St. Louis. There is bike an boat rental. Lots of biking and hiking trails. Large grass areas. Music on the weekends. Would stay here again. We camped at St. Peters' 370 Lakeside Park in a Motorhome. This was a great place to stay. It was right on the lake and had a great bike trail that went around the lake. Very clean and security went around on a regular basis. Had a nice concrete pad. It was extremely hot there in July so one negative is the lack of trees but hopefully over time they will grow and provide some shade. Also there was some type of long term resident in a vehicle without any windows that was a bit odd that was right across from us. It had a great location close to anything you need. We would stay here again if we were in the area. We camped at St. Peters' 370 Lakeside Park in a Fifth Wheel. Well maintained city run park next to man made lake with lots of open area. Sites are good size, and are grassy, however, there is no shade. There is no cable and WiFi is weak. Park is next to major highways and airport so it can be noisy. There are only 2 showers for the entire park and trash disposal is located in only 1 central area. Shopping, gas, restaurants are about 2-3 miles, and major city attractions are 30-40 minutes away. We camped at St. Peters' 370 Lakeside Park in a Motorhome. This is a city park with many activities. 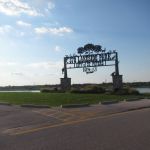 The RV park is on one end of the very large park. There is no shade. Sites are very level and are gravel. We had a pull through for our 37' motorhome. There was room for a tow car although we don't have one. I would definitely return to this easily accessible park. We camped at St. Peters' 370 Lakeside Park in a Motorhome. Called ahead for a midweek pull thru space. Quick and easy check in. Located just off 370 on the NW side of St. Louis. Wide level spaces. Dog park, canoe & kayak rental, and marina! The Rv park is a destination. We will be back and spend several days. Only negative was the trees were fairly small for this part of the country. We camped at St. Peters' 370 Lakeside Park in a Travel Trailer. Fairly new campground. Trees need to grow a little for shade but the sunsets and sunrises are gorgeous. We camped at St. Peters' 370 Lakeside Park in a Motorhome. This park was a great surprise. It was convenient to St. Louis and offered a very relaxing atmosphere. The lake and amenities were very nice. The roads and sites are clean and well maintained. We did not have the time, but would have loved to done some fishing. We camped at St. Peters' 370 Lakeside Park in a Motorhome. Make sure if you are in St. Louis to see the Arch, to make the effort to tour the Basilica!! We have toured cathedrals in Europe and this rivaled those. Take the tour with a guide at the Basilica. Mostly level sites, ours was a gravel pull thru. Utilities are well located and worked as expected. Campground was very clean and very well maintained. 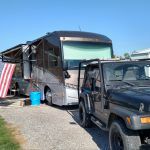 This is the first city run campground that we camped at and we were very impressed. We camped at St. Peters' 370 Lakeside Park in a Travel Trailer. Do check out the town of St. Charles, lots to do and explore. In St. Peters we tried a local place called 3 Families located on Mexico Rd. or street. Excellent food at a fair price. Plenty to do. You can rent kayaks for the lake. Walking trail around lake. We only stayed overnight but in the past, we have taken advantage of numerous restaurants and shopping opportunities as well as sight-seeing. Visit the historic part of St. Charles. Absolutely charming. Appears that the showers were located between the 1st and 2nd loops. All of St Louis, St Charles and St Peters is within easy reach. Historic St Charles is only a few minutes away. Quaint shops and great local restaurants and bars. Historical section of St. Charles is also n t and charming. St. Louis is fun but traffic is tough. Gateway arch, US Grant NHS, Anheuser Busch all good places to visit. Definitely go see the Arch and go on the tour. Well worth the money. We have a 48 lb dog and found Twin Rivers Kennel to give our dog a day camp day and it was $10.00 on the Saturday we left him. I would recommend them. We also went to Ulysses S Grant's Historic Site, it was a great tour. A very good documentary worth the time to go in. Closest shopping mall is on Zumbehl Road, off of I-70, about a 10 minute drive away. Visit old town St Charles. Plenty of good restaurants close by. Only 20-30 minutes to St Louis attractions. St. Charles is close and the historic part looked like it would of been very nice to walk around. Office rents bicycles, kayaks, canoes, paddle boats. We visited Forest Park, The Loop and old St. Charles. 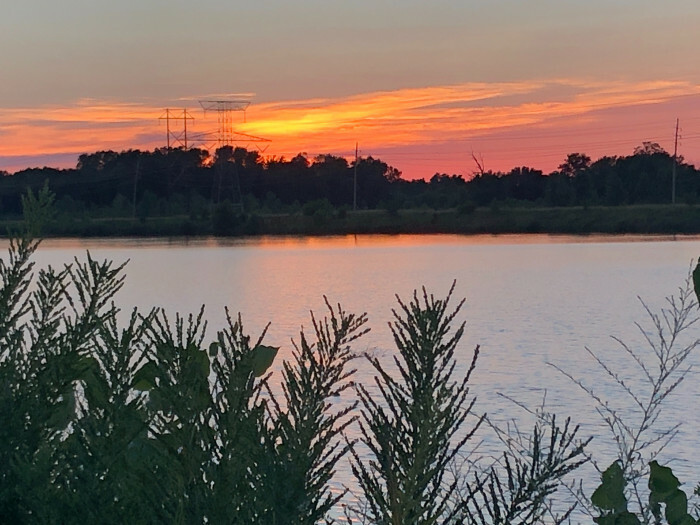 There's plenty to see and do in the St. Louis area and this location served us well. Be SURE that you visit the Cathedral Basilica of St. Louis 83,000 square feet of mosaics using 41.2 MILLION pieces of glass. Grant's Farm and if you like horse, take the Clydesdale tour at the farm. Right next to Grant's Farm is the U.S. Grant home, which is free. There are also tours of the Anheuser-Busch Brewery available, there is a complimentary tour, which is free, as well as some paid tours. There is also the Arch and Baseball Village. It's great and we'll stay again and recommend it to other's! Plenty of restaurants, shopping and gas very nearby. We highly recommend "Erio's Restaurante", about 5 miles away as a great small family run place to have a great Italian meal. St Charles has many quaint restaurants and shops, Lewis and Clark Museum. Mid Rivers Mall is just a few miles away. If you want to shop 'til you drop this is the place to be. Every store you can imagine is here and easy to get to. Shopping is available within 10 mins of the park and you can bring your boat to the marina that is on site. Close to lots of shopping, Costco, Sam's, Walmart and more all within a ~10-15 minute drive. Mid lakes mall is nearby, every restaurant chain imaginable within 5 miles. Every type of fast food and big box store is close by. This park would be great for an overnight stop and stocking up for a longer stay somewhere else. If staying to visit in St. Louis, take advantage of the free museums and zoo! City Museum, while it does have a fee, is a fabulous place - like a playground for adults (though there are kids there as well). The drive between the campground and downtown STL was about 30 minutes. We went into St Louis to see Arch and we ate locally at Sugarfire Smokehouse, which was great. 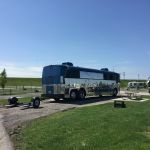 We ventured down to Busch Stadium for a ball game, the Hollywood Casino Amphitheater for a concert, and to walk around historic downtown St. Charles. Minutes from all of them. Are you affiliated with St. Peters' 370 Lakeside Park ?